“Summit’s relationship with Brown Forman is the true definition of a partnership." 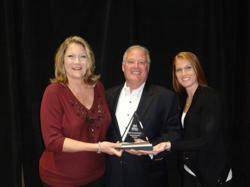 Summit Group is proud to announce the awarding of the 2012 PPAI Pyramid Award for Consumer Programs. The Silver place award was won for their work with Brown Forman and the Jack Daniels online virtual gift shop. The truly collaborative partnership between Summit Group and Brown-Forman resulted in a 46% increase year-over-year with their new online store that brings unique Jack Daniel’s licensed product to its fans around the world. Jack Daniels has offered an online store in the past and re-launched the site with the help of Summit Group. The account team, Anna Cheney and Lindsay Pechi, work closely with the Brown Forman teams to produce and sell premium Jack Daniel-branded product with an upscale online presence. “Summit’s relationship with Brown Forman is the true definition of a partnership. This creative collaboration has brought so many exciting new products and experiences to the Jack Daniel fans,” says Anna Cheney. A great brand presence has been developed because of this partnership and innovative and consumer-sought products provided by PPAI product providers. The online store saw an increase in sales momentum and web traffic through season and event-specific campaigns that deployed e-blasts and site advertising. A virtual suggestion box provides over 200 valuable suggestions per month and these enable the team to learn consumer’s buying patterns and retail trends, leading to fresh merchandise. Summit Group brings talented teams to the table – account management, merchandising, marketing, web development, warehousing, fulfillment and distribution. Brown Forman and Summit Group work together to further their brand and consumer engagement. Summit works to promote the Jack Daniels brand through protecting and working within the distinct brand licensing. With roots dating back to 1969, Summit brings you dedicated, full-service teams throughout the United States. Summit leverages three distinctive disciplines to motivate your audience at every touch point; Branded Merchandise, Engagement & Recognition and Marketing & Communication Services. We call it The Power of 3. You will call it a well-integrated plan to energize your brand in new ways. As a single source to engage your audience on multiple levels, Summit delivers a truly powerful brand experience. Since 1903, the Promotional Products Association International, a not-for-profit, has been the standard-setting international trade association for the promotional products industry. PPAI offers education, tradeshows, business products and services, mentoring, technology and legislative support to its members. For information regarding PPAI or to learn more about the proven power of promotional products, visit the PPAI website at http://www.ppai.org.